We have 4 of these Grey Mesh Upholstered Bar Stools in stock, which would make a funky addition to any breakout area. Complete with a footrest, this stool features a chrome base with a curving ridged seat for optimum comfort. If you would like further information out about these stools, our sales team is on hand to answer any of your questions and can be contacted by calling 07944 508282. 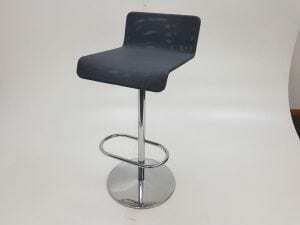 If these are not exactly what you are looking for, we do have other stools available among our miscellaneous items. Just click on the link provided. If you are viewing our website on a mobile device, you can click on the telephone icon located at the bottom of this page, or simply enter your details into our ‘request a quote online’ form below and one of our sales team will be in touch very soon.